Shivaji Panikkar, who was also suspended over the 2007 incident, claimed the university is "only being vindictive" by holding back his dues. 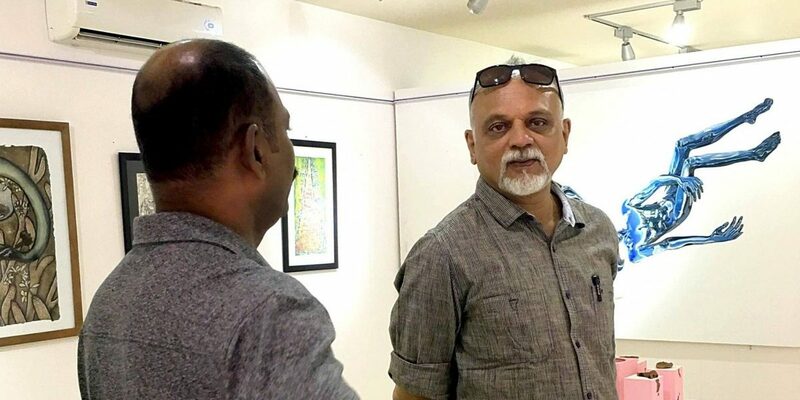 Mumbai: Shivaji Panikkar, a former dean of Baroda’s Maharaja Sayajirao University, has been denied dues of 20 years for defending the artwork of a student at an exhibition on ‘Religion and Sexuality’ in 2007. He had also been suspended for the same for four years. The decision, taken in an 11-year-long departmental inquiry conducted by a retired judicial magistrate, states that Panikkar’s pending dues and all retirement benefits – amounting to several lakhs – will be “suspended permanently”. 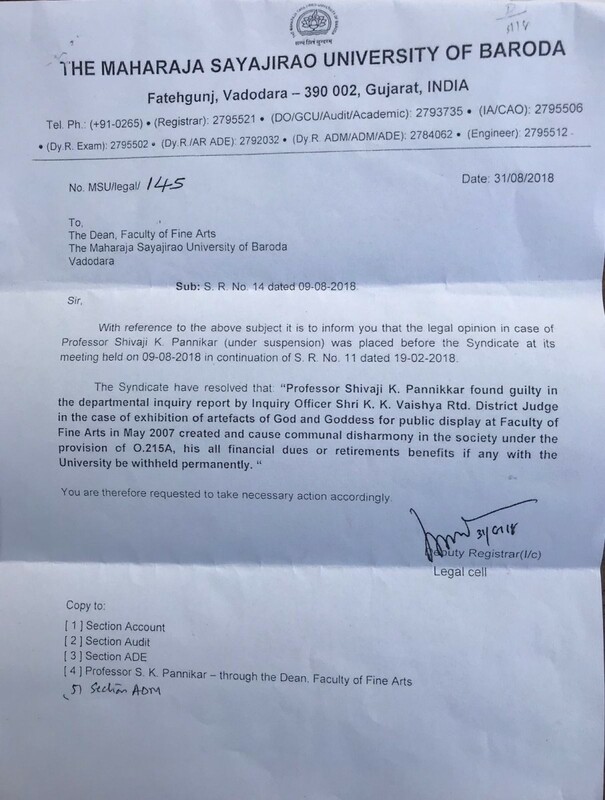 Panikkar, who was the dean (in-charge) of the faculty of fine arts, had been suspended in May 2007 for defending a student, Chandramohan who had exhibited paintings of religious icons with anatomical details. He had allegedly depicted Jesus and goddess Durga in an “obscene manner”. Fringe groups Vishwa Hindu Parishad and Bajrang Dal had complained to the police about the campus event, following which the then 23-year-old student was suspended and arrested under Section 153 of the IPC for “wantonly giving provocation with intent to cause a riot,” and held in jail for four days before receiving bail. Chandramohan had exhibited his paintings as a part of a coursework assessment. However, the committee has considered this coursework as an independent public exhibition. Panikkar claimed these manipulations were done during the probe only to harass him and his former student. A copy of the university order. “Professor Shivaji K Panikkar (is) found guilty in the departmental inquiry report by inquiry officer K.K. Vaishya (retired) district judge in the case of exhibition of artefacts of God and Goddess for public display at faculty of Fine Arts in May 2007 created and cause communal disharmony in the society… his all financial dues or retirement benefits if any with the University be withheld permanently”. Expressing his dismay, 65-year-old Panikkar told The Wire that he had assumed the university was done punishing him by putting him under suspension for four years. “I was already under suspension from May 2007 to 2011, when I finally quit. My salary was denied and I was kept away from the daily academic work for those years. The university is only being vindictive by holding my dues back now,” he said. Panikkar has had a long association with the university. He began working as a research fellow in 1981 and then later in several capacities as a documentation staff, professor and finally as a dean (in-charge) of the art department when the incident took place in 2007. The committee, headed by retired district judge K.K. Vaishya, submitted its report in August 2018 but the decision was not communicated to Panikkar. He said he accidentally came across the order copy in December when he visited Baroda seeking updates. Panikkar, who is presently teaching at Ambedkar University Delhi (AUD), will be retiring in a few months. He said the order will also have a bearing on his dues he is supposed to receive from AUD at the time of his retirement. “I am entitled to a few lakhs as post-retirement benefits from AUD. That too will be held back now.” Panikkar said he is consulting lawyers and will soon be challenging the order in the court. Like Panikkar, Chandramohan too had to pay a hefty price for his work. At 23, Chandramohan was sent to jail. Now, even 12 years later, he has not received his college passing certificate. In February 2018, out of sheer frustration over university’s apathy, Chandramohan allegedly took the drastic step of setting fire to the office of the vice chancellor (VC) of the university. He was immediately taken into custody and was released on bail by the high court only several months later. At the time of his arrest, a visibly disturbed Chandramohan had told the media: “Mera 11 saal se certificate nahi mila, sir (I have not received my certificate for 11 years, sir).” While confessing to his extreme act, Chandramohan told the media that he had not been heard for over ten years. “I have written 30-40 letters to the VC. I was not told the reason for non-issuance of my result or even the grounds for withholding it for 11 years,” he had claimed. Chandramohan, who grew up in East Godavari, was the first person from his village to attend university. His father works as a carpenter and was hopeful that Chandramohan would be able to support the family with his work. But that never happened. He was denied his degree from the university and also a space in art galleries. In 2007, he was granted bail on the condition that he would not leave Gujarat, which meant he would live in an unknown state without a formal degree. “He has had it really tough. No art gallery is ready to display his work. He is a brilliant artist and he has continued to produce art in the past decade. But sadly no one has shown courage. Even those who preach freedom of expression,” Panikkar dismissively said. Panikkar said he has been writing to the who’s who of the art world asking them to raise their voice in his and Chandramohan’s case. “But no one has come forward. It is disappointing to see how this space continues to be self-centred and not speak up when required. I am 65 years old now and do not have the energy to fight this all alone. Even worse is Chandramohan’s case. The university did not even let his career to begin. He was criminalised for his art,” Panikkar added.